Microsoft and Infinity Ward have just announced the new Modern Warfare 2-themed Xbox 360 console bundle in Los Angeles. 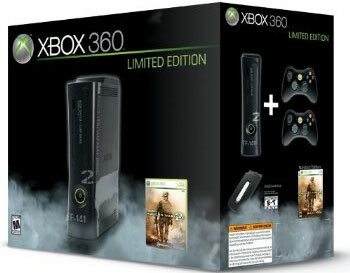 The bundle comes with a somewhat reasonable $399 price tag, which includes the brand new 250GB hard drive, themed console, Modern Warfare 2 (duh), two wireless controllers and everything else that comes with the normal Xbox 360 SKU. If you are interested in pre-ordering it, check out Amazon.com.